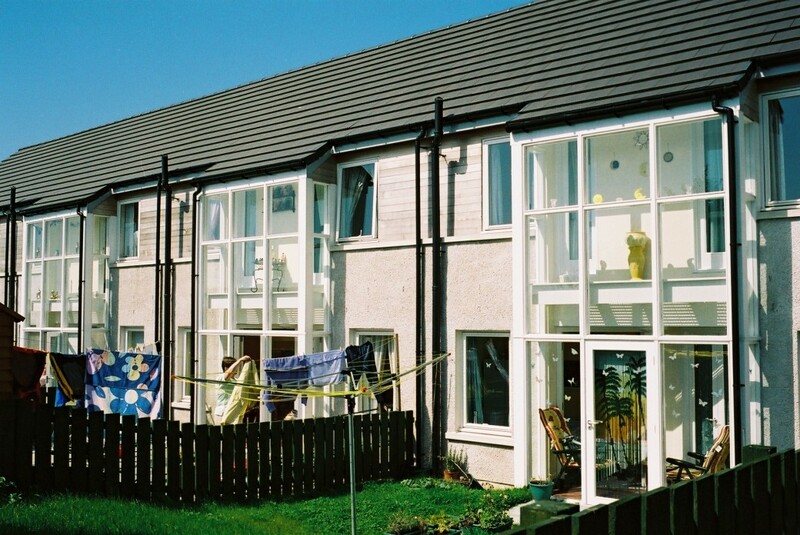 Completed in April 2003, this was Ayrshire Housing’s first completion under its new banner. Designed by ARP Lorimer and Associates; the builder was Barr Ltd. It complements an earlier 8 cottage scheme and three private houses also designed by ARP Lorimer and Associates. It consists of 19 one, two and three bedroom houses arranged in a courtyard. adaptability to differing lifestyles and household types. two houses to full wheelchair standard;all others easily wheelchair adaptable. full height sun spaces exploit southern orientation. latest electric heating system, programmable over three tariffs for different and changing lifestyles. NuAire positive input ventilation minimises heat losses and feeds in warm air from roof spaces and sun spaces – this combined system is being prototyped by NuAire and Ayrshire Housing. This development is a first in converting sunspaces from passive to active solar collectors. In so doing, it addresses the previous weakness of sunspaces in terms of their reliance on the actions of the occupiers to obtain the maximum thermal benefits. By building on a commercially available technology through continuous improvement, it should be capable of ready replication in a wide variety of housing projects.